Respond automatically to changes in backed up folders on NTFS* drives to immediately copy the changes to the backup. Free evaluation for business or commercial purposes is allowed, on one computer only (subject to limitations) - see Registration under Main Menu. * NTFS is the standard file system used by default by Windows NT, Windows 2000, Windows XP, Windows Server 2003, Windows Server 2008, Windows Vista, Windows 7 and Windows 10. Future replacement file systems (e.g. ReFS) are expected to inherit the same change notification feature. 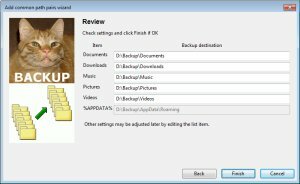 BackupCat is supported on Windows operating systems Windows 7 or Windows Server 2008 R2 and later versions, and has been tested on Windows 7, Windows Server 2008 R2, and Windows 10. BackupCat is normally installed by running the installer "Install_BackupCat32.exe", which may be packaged inside a zip file for distribution, i.e. "Install_BackupCat32.zip". The 64 bit version is installed by "Install_BackupCat64.exe", packaged as "Install_BackupCat64.zip"
Run the installer normally (do not start it by running "as administrator"). Windows will display a User Account Control dialog to ask if you want to allow the program to make changes on your computer. You will need to allow this in order for the scheduled task that runs BackupCat at log-on to be installed, and to get the rights to install for all users. Clicking Next takes you to the Licence Agreement page. All licence details, including third-party licences, will be available in the installation directory after installation. After you click I Agree, the installer takes you to Installation Options. You can choose to install for all users (application will be available to all users who log on to the computer, and will be scheduled to run at log on for all users - this is the most common type of installation for the average Windows user), or for the current user only (application will be available only to the installing user, and will be scheduled to run at log on for the current user only). Clicking Install then starts the installation process. At the end of the installation log displayed on this page, you should see "schtasks returned 0" and "Completed", which indicates that the Scheduled Task was successfully installed. When installation is complete, clicking Next displays a page that is titled "Completing BackupCat Setup". This includes a checkbox to run BackupCat, which you can check if you want to run BackupCat immediately, and a checkbox to create a desktop shortcut. If you don't want to have a shortcut on your desktop to launch BackupCat, uncheck the "Create desktop shortcut" checkbox. You can then click Finish to close the installer. If you don't run BackupCat from the installer, it will start automatically the next time you log in, via a Scheduled Task added by the installer, or you can start it from the Start Menu, or the desktop shortcut if you created it. Close the app first if it is running (right-click and select Exit on the BackupCat icon in the System Tray). To uninstall a previous version, open Programs and Features by clicking the Start button, clicking Control Panel, clicking Programs, and then clicking Programs and Features. Find BackupCat in the list, right click the entry (In Windows 10, left click the entry) and then click Uninstall. Alternatively in Windows 10, open the Start menu, click Settings, click System, select Apps & features, find BackupCat in the list, left click the entry and then click Uninstall. You can also type 'add' into the Start menu search box and select 'Add or remove programs', then uninstall BackupCat from the list as above. The uninstaller will also automatically remove the Scheduled Task. After you have installed the application it should be available through the normal APIs, e.g. Start menu and desktop shortcut. It should normally start automatically when you start your computer and log in, via a Scheduled Task. The Scheduled Task is normally delayed for a minute after log-on, to allow time for Windows to initialise and reconnect to network resources. You can exit the program if you wish and restart it later. The application contains a notebook of 3 pages. The first page is for backup folder pair entry, the second page is for user settings, and the third page contains a display of logs for routine monitoring and error logging. You can resize the dialog, and its size and position will be saved for the next time you use it. You may need to configure your notification area icons to make the icon visible. In Windows 7, right-click on the Taskbar, choose Properties, click the Customize button, and the control panel titled "Control Panel\All Control Panel Items\Notification Area Icons" should open to allow you to change the settings. In Windows 10, right-click on the Taskbar, choose Properties, click the Customize button, and then click "Select which icons appear on the taskbar" to configure, or click on the up-arrow in the notification area to pop-up the hidden icons. "Reset to default control panel position" - this restores the app's default size and position (e.g. if it is no longer visible after a change of dual monitor configuration) and shows the control panel. "Exit" - closes the app, after showing a confirmation dialog. If you answer "Yes", it will stop running and backups will not be done until the app is started again. Note: The system "Close" button (square with a cross) at the top right of the app will not close it, but minimise it to the system tray (this is to avoid accidentally shutting down backups after checking the control panel). To completely exit the app, use the popup menu "Exit" command, File/Quit menu command, or "Quit" button. Before any files can be backed up, you must configure the list of backup folder path pairs to specify what is to be backed up, and where to (see the subsequent section on "Setting up Backup Folder Pairs"). The Folders page is where you set up the folder path pairs for backup. A folder path pair consists of a source folder and a destination folder. Backup consists of copying all of the files at the source, including nested subdirectories and files, to the destination folder, according to the "Copy Mode" setting. Folder pairs can be added using the "Add a New Folder Backup Pair" button, or the "Common Backup Pairs" wizard button. 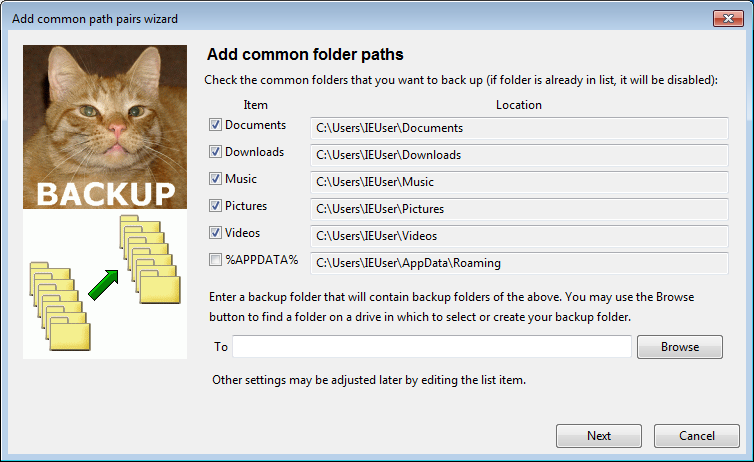 If you use the default Windows Documents structure, you may have data files in the built-in Downloads, Documents, Music, Pictures or Videos folders, in which case you can use the "Common Backup Pairs" wizard button to quickly and easily set up backup folders for your files and add them to the list. 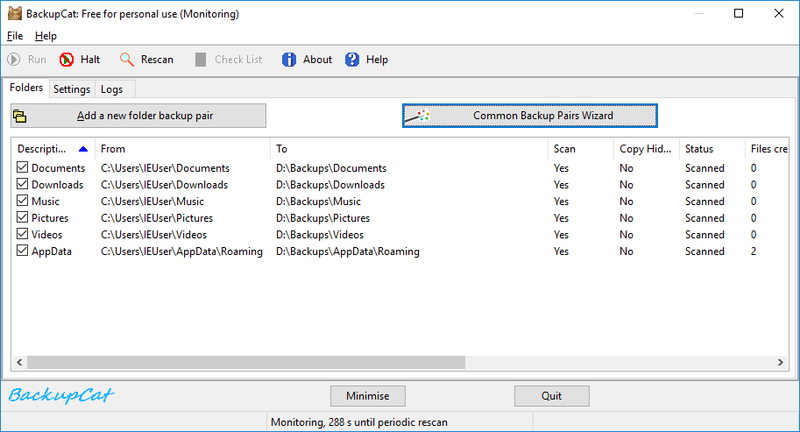 The Wizard finds and shows the locations of the Documents, Downloads, Music, Pictures, Videos, and %APPDATA% folders that will be used as the source for backups. Each item can be included or excluded according to the state of the checkbox to the left of the location. 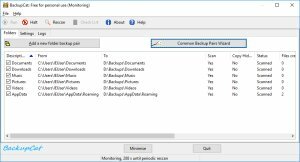 If the item is unchecked, as the %APPDATA% folder is by default, the item will be excluded from the backup folder pairs to be added to the backup pairs list. Check the folders that you need to back up before proceeding (If you need to, you can check what is present at the location by copying it from the location box and pasting it into Windows Explorer). If a source item is already in the backup pairs list, its row will be disabled but you can include others that are not already in the list. Next, select a suitable location for the backup copies that is a physically separate drive or a networked drive, but not on the same physical drive as any of the source folder locations (you can change the destination folders for individual items later if necessary). This needs only to be a single folder, as subfolders for each of the selected items will be created automatically later. You can use the Browse button to find and/or create a suitable folder as illustrated below. Browse to the drive where backups are to be created, and if you need to create a folder, right click and select "New", and then "Folder" as illustrated below. Change the name of the "New Folder" that appears to something suitable, e.g. "Backups", with the result as shown below. Then close the Browse dialog with the "Select Folder" button, and the path of the wizard's "To" folder will be filled in, e.g. "D:\Backup\". Click the "Next" button to open the next page of the wizard. This shows the locations of the automatically-generated destination folders for each of the selected items, as illustrated below. Source folders that are already in the list or were not checked will be shown disabled ("greyed out") and will not be added to the backup list. The "Cancel" button will close the wizard without doing anything (nothing will be added to the list). The "Back" button will return to the previous page of the wizard, if you want to change any of the settings there. Click on the "Finish" button to create all the backup folders and add the backup folder pairs to the backup pairs list. 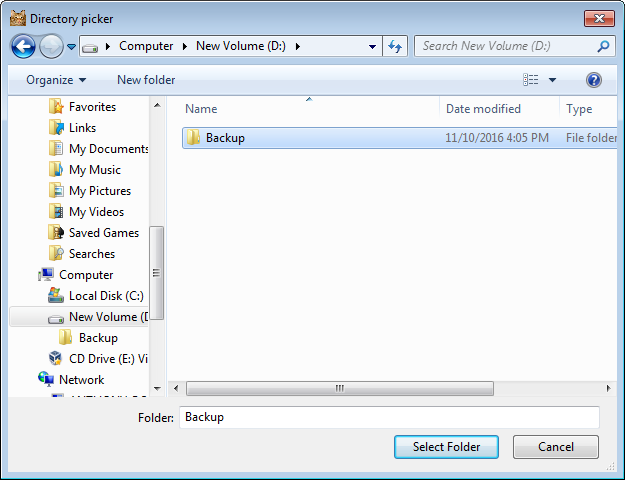 Folder pairs may be entered by clicking the "Add a New Folder Backup Pair" button. This opens a dialog as shown below. Source folders contain the data that you want to back up. Destination folders can be separate physical drives on your computer, or shared drives on other computers in your network, or drives attached to the network or network devices such as routers. In this help file, network shares will be illustrated using the USB stick network sharing facility that appears on routers made by Netgear, by way of example (for more details, see under "Adding Network Shares"). Against "Label", enter a descriptive label for the backup item - this could be a single word e.g. "Data", or a word plus a number e.g. "Item 1" - by choosing words and/or numbers carefully, you can sort the list into convenient groups using the column sort feature. You could also use a short sentence to describe the nature of the backup or simply use the name of the last folder at the backup "From" point. Against "From", enter the path to the folder that you want to be backed up (the source). The Browse button on the right will open a folder browsing dialog to assist in selecting the path. Against "To", enter the path to the folder that files will be copied to (the destination). The Browse button on the right will open a folder browsing dialog to assist in selecting the path. To help ensure that backups don't inadvertently create folders in the wrong place, the top level destination folder won't be created by BackupCat, but must already exist - so you may have to create it first, e.g. in Windows Explorer (you can also do this in the browse dialog). If you are backing up files to a removable drive, try to specify a folder name that will be unique to that drive, and this will help ensure that backup files won't be written incorrectly if the "wrong" drive is inserted. The source and destination folders should be on different physical drives. There is not much point in having them on the same drive, as any failure of the drive would most likely render the copy inaccessible at the same time as the original. If you use a removable USB drive for backup on the same computer, you can take it with you and keep a copy of your data with you wherever you go (for further information, see "External and RDX drives" under "Backup Recommendations". Always eject flash drives before physically removing them (you may need to halt or quit BackupCat first as it may be accessing files on the drive). To eject a drive, click the "Safely Remove Hardware" icon in the system tray, and select your drive from the list. If you use a removable drive for backup, you should consider whether you have adequate physical security for it if you are backing up any personal or sensitive data; or whether you need some form of software protection to protect your data before it is backed up (e.g. by using 7Zip to store files in password protected Zip files, or some other suitable third party data protection software). The Check buttons for the From and To paths will check that the paths entered exist and are accessible. You might find these buttons useful if you cut and paste the paths from somewhere else, rather than pick them using the Browse dialog. The "Include in periodic scans" checkbox (checked by default) enables the pair to be scanned periodically, according to the periodic poll interval in the Settings tab, whether or not a change notification occurs. If change notifications are working for the source that you specify (normally true for local NTFS drives), you can uncheck this checkbox. If the source does not support change notifications, leave the checkbox checked. To test if change notifications are working, set up a backup pair of folders that don't contain much data (either existing or temporary ones for the test), wait until BackupCat is showing the "Monitoring" status in the status bar and create a new file at the source. The source should be scanned immediately and the file copied to the destination. Then if you delete the file, and you have the copy mode set to "clone/mirror", BackupCat should again scan immediately and delete the file from the destination. If on the other hand the file is only copied after the periodic scan timeout period expires, then change notifications are not working for that source. You can also check the "Log Change Notifications" box in the options page and look for reports of change notifications in the log window. The "Copy Hidden Files" checkbox (unchecked by default) enables copying of hidden files. Finally, click the OK button if you are satisfied with the folder path pair and wish to save it, or Cancel which will discard all data entered. Folder pairs are listed using the data entered as above in the central list on the folders page, which has main columns "Description" corresponding to the "Label" above, "From", "To", "Scan", "Copy Hidden", and "Status". If you right click on a row, the "List Options" context/popup menu appears, with options to edit or delete the row, and to move the selected row up or down. 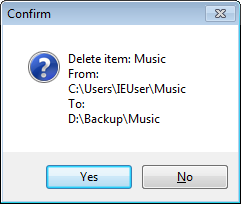 Click "Yes" to confirm that you want to delete the folder pair, or "No" to cancel the delete leaving the folder pair unchanged. The "Status" column is used to display error messages, and at the same time the row will change from black text to red text until the error is cleared. The most common error messages are "Source path does not exist", "Destination path does not exist", and "Insufficient space at destination". If such an error condition exists, the backup described by the affected row will not take place. In normal operation the "Status" field should remain blank or display "Scanned". Each pair in the list has a checkbox next to the Description/Label, which should by default be checked (enabled). If you uncheck the checkbox, that folder pair will not be backed up. Using Netgear's Readyshare system as an example, depending on your system you might be able to access a "Backup" folder on a USB drive on your router by the path "\\READYSHARE\USB_Storage\Backup", or by "\\readyshare.routerlogin.com\USB_Storage\Backup", or by "\\192.168.0.1\USB_Storage\Backup" (consult your router manual for further information). Note: On some systems Netgear's READYSHARE fails to be accessed as \\READYSHARE\USB_Storage. In this case it may be accessible as \\readyshare.routerlogin.net\USB_Storage or \\readyshare.routerlogin.com\USB_Storage. If you set up backups to a network share, be sure to check access permissions are set up properly if you are backing up any personal or sensitive data. This may involve setting read/write access for a particular user (procedures will depend on the hardware being used). If you restrict read/write access you will need to log on to the device before you can access it from BackupCat. To log on to your network share with restricted access, look under Network in Windows Explorer and click the name of the share - Windows should open a logon dialog. You need to check the "Remember my credentials" box to not have to enter credentials each time you use the network drive, so that when you log on, BackupCat can access the drive automatically, otherwise your files can not be backed up to the network drive. All storage devices fail eventually, and at that point you are very likely to lose data that you have stored there, unless you have made a backup. 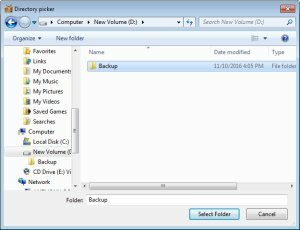 If you have to consciously remember to make backups at intervals, you backup data is only going to preserve data up to the last time you remembered to make a backup. The advantage of having a continuous automatic backup in place should be obvious. The minimum necessary for backup is a procedure that keeps 2 copies of your data in 2 separate physical devices. Then, with the probability of both devices failing simultaneously being much lower, you will be able to renew the failed device and your data will be preserved. Sometimes a common cause can affect two separate physical devices - for example, a catastrophic power supply failure, or physical damage to the machine. It's desirable to keep a triple backup to guard against such eventualities, in which you make a third backup copy of the same source data, but take care to keep it in a different location. With this method, you have a backup close by that you can use for rapid restoration of data, and another at some distance, preferably off-site, which is not subject to the same physical threats as the other data (fire, flood, etc.). BackupCat can be configured to copy the same source data to 2 different destinations, which are simply 2 separate rows in your folder pair list, thus conveniently automating your triple backup solution. 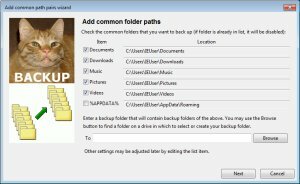 Alternatively you could periodically make a manual backup to your third backup media using whatever method you prefer, but BackupCat will make the process automatic and continuous. The ability to easily specify multiple folder pairs for backup supports an efficient backup process. When you are working in a particular area, making changes, the automatic change notification system allows that area to be scanned immediately, without wasting time scanning unrelated areas. You are also able to narrow down your requirements for backups to those vital document areas that must be preserved, whereas other files such as operating system files, applications and databases that can be replaced from distribution media can be ignored, or backed up as part of a more infrequent disk image backup. To make the best use of this method of backup you should therefore choose your backup folder pairs carefully. Don't back up the whole user folder (or the whole system drive) as it will attempt to copy hidden system folders that don't need to be copied, generating distracting errors in the logs, and frequent changes that the operating system makes to its files will trigger backup continually and unnecessarily. You'll also be copying many files that you don't need, e.g. Windows files and third party applications that can be restored from original installation media, a system image, or recovery media, and in cases of system corruption where the drive hardware is still sound, from a recovery partition or a restore point. Backing up a whole drive (especially system drives) containing many GB of data as one folder pair item will necessarily take a long time for each processing stage, even when simply checking files that have already been copied, which is inefficient. If you use the default Windows Documents structure, most of your data files are likely to be in the Downloads, Documents, Music, Pictures or Videos folders, in which case you should create a backup folder pair for each of these that you use, and if there are a lot of files in one, divide it up by sub-folders into a set of backup pairs for more efficient scanning. If you have data files on a main drive (e.g. C:\), and you have an extra, physically separate, general-purpose drive (e.g. D:\) it makes sense to backup from your data folder(s) on C:\ to a backup copy on D:\. This will preserve your data in the event of failure of the C:\ drive. If you have other data files on the second drive (e.g. D:\) you could make a backup for these on C:\. As long as you have a copy of your primary data files on another physical drive, you preserve your data from failure of a single drive. If your main system drive is limited for space, for example if you have a solid-state drive for Windows system files, and have moved bulky data to a second drive (which might be a larger disk drive) it would not be sensible to copy the bulky files back to the main drive for backup purposes, because of the limited space. In this case you should consider getting a third large disk drive to keep backups on, or put your destination folders on a external networked drive. Some data might need backing up from the %APPDATA% folder. Windows uses the %APPDATA% folder for application-specific data (in a networked domain, it should also roam with the user profile). 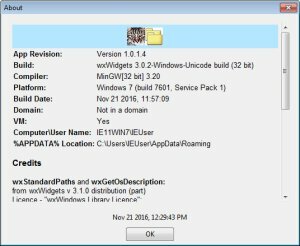 These folders can be located by using the Start/Search box and entering %APPDATA%, then click on "Roaming" or "%APPDATA% File Folder" and explore from there. You might not be able to locate this folder in Explorer or the Browse dialog if you have the setting for hidden files not to be displayed. 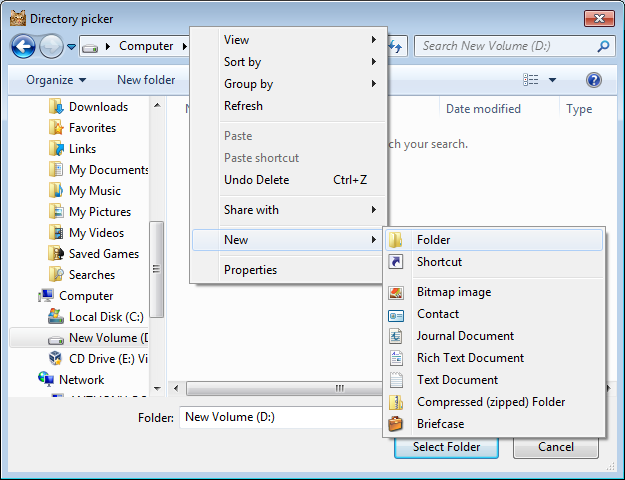 To make the hidden files visible, in Windows 7: Click on the Organize button in any Explorer folder, and then select "Folder and Search Options" from the menu, and then click the View tab, and select “Show hidden files and folders” in the list, or select the Start button, select Control Panel > Appearance and Personalization > Folder Options > View tab and under Advanced settings, select "Show hidden files, folders, and drives", and then select OK. The location of the %APPDATA% folder is also shown in the About dialog box of BackupCat. In Windows 8 and 10, the Explorer ribbon's View tab has an Options button which allows you to select "Show hidden files and folders". It is recommended that you create backup pairs for relevant subfolders rather than the main %APPDATA% folder, because some apps that continually update settings (for example: Macromedia Flash Player, Microsoft Windows, Mozilla Firefox) will cause change notifications to trigger the backup process continually, and unnecessarily, unless you really need them backed up. There is also a %LOCALAPPDATA% folder for application data, but this is normally only used for temporary data that doesn't need to follow a roaming profile and won't need backing up. Don't back up folders from one letter drive to another letter drive if they are simply partitions on the same physical drive. You need to be creating a backup copy on a physically separate drive so that you have 2 copies of your data in 2 physically separate devices. To check drive locations, click Start, right-click Computer, select Manage, then click on Disk Management in the tree control, which will display each drive on a row showing which drive letters are contained as partitions within each drive. In Windows 10, search for "Computer", then click on Computer Management, then click on Disk Management in the tree control. By default, the user folders created by Windows are located on the drive where Windows was installed, normally C:\. If you look in Windows Explorer under Desktop, you will find a location named after your log-on username. Under this you will find folders such as "My Documents", "My Music", "My Pictures", "My Videos", but if you select "My Documents" and click on the address bar you will see that this is a symbolic link to "C:\Users\username\Documents", or it could be "D:\Users\username\Documents". The Desktop tree is independent of drive letter and you can change the location of "My Documents" by right-clicking on it, selecting Properties, then the Location tab on the dialog that comes up, and then specify a location on the current hard drive, another drive (e.g. when you have Windows on a small, fast solid-state drive and you want your data files on a second large conventional drive), or even another computer on your network. Therefore you need to be careful when planning the destination for backups from these locations to notice the drive that they are located on at source, as you do not want to inadvertently copy them to the same drive instead of a physically separate drive, which will render the backup useless if the drive fails. The "Common Backup Pairs Wizard" will find and show the locations of these folders automatically. 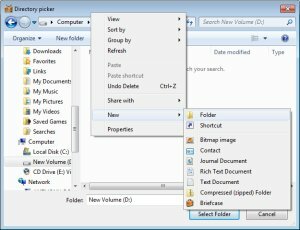 In Windows 7, you can use the browse dialog in "Add a new folder backup pair", look under Desktop for the location named after your log-on username, click on "My Documents" and the target location will be copied in to your "From" entry box when you exit from Browse with "Select folder". In Windows 10, the user folders are listed in Windows Explorer under "Quick access" and/or "This PC". To get the path to their location you can right-click (e.g. on Documents), select Properties, click the Location tab on the dialog that comes up, then you can copy the target location from the edit box on that dialog. When browsing in "Add a new folder backup pair", you can simply click on "Documents" and the target location will be copied in to your "From" entry box when you exit from Browse with "Select folder". Drive mapping lets you conveniently associate a local drive letter with a location such as a shared folder on a networked computer, or an internet location such as an FTP site. This can be done by using the Map Network Drive Wizard. Although it may be convenient to use mapped drive letters to access network shares like, for example, "\\READYSHARE\USB_Storage\MyData", BackupCat does allow you to use such UNC addresses directly as a folder, and you can locate them under "Network" in Windows Explorer, select the relevant folder, and copy the address from the address bar of Explorer, or locate them in the Browse button and select them directly in the "Add New Path Pair" dialog. In Windows 7, click Start, then right click on "Computer", then select "Map network drive". In Windows 10, right click on "This PC" in File Explorer, then select "Map network drive". In the Map Network Drive dialog, specify the drive letter you want to use for the connection, then click on the Browse button and select the network location that you want to map. Find the computer and shared folder from the networked list that you want to map to (this should also include router storage facilities like Netgear's READYSHARE) and click on OK. You may be asked for a user name and password for the storage device, which should be whatever you used to set up the shared storage device. If you want Windows 7 to reconnect mapped drive letters every time you log on, make sure you check the "Reconnect at logon" box. Click on Finish to complete the mapping. To map to an FTP Site, start up the Map Network Drive wizard as before, but in this case click on the link that says "Connect to a Web site that you can use to store your documents and pictures." A new "Add Network Location" dialog will open up. Click Next, then click on "Choose a custom network location". You can now enter the location of the FTP site or other network location. The Browse button will also list your local network locations. Note: On some systems Netgear's READYSHARE fails to be accessed as \\READYSHARE. In this case it may be accessible as \\readyshare.routerlogin.net or \\readyshare.routerlogin.com. You can use an IP address or a name for the site. Click Next and a dialog will display "Specify a User Name and Password if Required". If the FTP site allows anonymous connections, leave the 'Log on anonymously' check box ticked. Otherwise, uncheck it. If you uncheck it, you need to enter the user name and click on Next. A dialog will display "What do you want to name this location?". Enter the name that you want and click on Next. A dialog will display "Completing the Add Network Location Wizard"; you can now click on Finish. If you need username and password to connect to the FTP site, you will be prompted for them, and can check the box that says "Save password" if you don't want to re-enter it every time. You can map OneDrive as a network drive in Windows 10, independently of the sync setup between OneDrive online and the OneDrive folder on your hard drive, and map it as a network drive. First log into Onedrive, then get the CID number that appears in the address bar after the "cid=" part (do not include extraneous characters such as % or &). In Windows Explorer, go to This PC, click on the Computer tab, then "Map network drive". In the Folder field, enter https://d.docs.live.net/ followed by the CID number. Check the "Connect using different credentials" box, click Finish, and enter your OneDrive login credentials. Your Onedrive folders should now be available under This PC in Windows Explorer. Flash drives can be used for backup, and are certainly convenient as they can be removed from your computer when not in use and carried with you to act as a kind of "off-site" backup, but they have a tendency to fail suddenly after more or less use and you will find that the feedback comments made at online stores where cheap drives are sold often contain reports of devices that disappointed by failing too soon. They are easy to mislay, less reliable than a good disk drive, and slower (although genuine USB 3.0 drives are improving on speed). Frequent use for copying backup files could cause them to wear out prematurely, so use them with caution and check their integrity frequently. Failing to eject a flash drive properly can cause the data to be corrupted, which you might not notice until you plug it in again. Flash drives' retention time can deteriorate over their lifetime. Flash drives should really only be used in conjunction with backups to other media as well. A strategy worth considering is to have 2 or 3 different flash drives that you can plug in to appear as the same destination drive, so that you can back up to each in turn on different days, but of course you have to remember to swap them around and check that they are all working properly. External hard drive enclosures containing a 2.5 or 3.5 inch hard drive and a USB connection are a common and relatively low cost way of providing backup media that can be easily removed and stored in a separate location from your computer. The enclosures (also known as a caddy) can be obtained separately allowing a general purpose hard disk to be fitted, with eSATA or USB connectivity. An RDX drive (Removable Disc Exchange) gives you the ability to backup from one drive to another, as for a pair of internal drives, but also the drive is easily removable and designed to be robust for transport and storage separately from your computer. An RDX hard disk drive device is mounted as a removable disk drive and can be connected via SATA or USB. 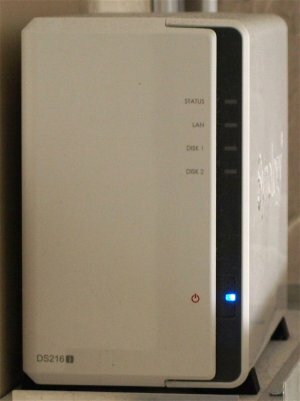 A Network Attached Storage (NAS) device is a container for 1 or more storage devices, with an interface to a network, that makes the drives available to computers on the network. As well as providing a local network share address and a separate physical device that can be shared amongst PC and laptop users for backups, some NAS devices have built-in support for accessing your files over the Internet. This can be used to provide off-site backup with BackupCat if you have access to a friend's NAS, or a company NAS at a separate location. Check your NAS device manual for details. Port Forwarding can be used to make your network resources available over the internet, or to make network resources at a remote location available to you. You will need to know the IP (if it is fixed) or the domain name for your network and the remote one, as seen from the internet. Port forwarding may be a facility built-in to your router, so check the router's manual for further details. Network shares can be made to work over the internet, for example from a friend's network, as if they were a network drive on your own network, using Virtual Private Networks (VPN). This is an encrypted point-to-point connection across the Internet between two locations which offers better security than port forwarding. Many router manufacturers supply routers with built-in VPN clients. Note that careful attention should be paid to network security implications, such as ensuring correct configuration of all settings, testing, and employment of a suitably qualified IT professional to set it up, to be on the safe side. Consult your router instructions to find out how to configure the VPN tunnel settings on the router at each site. For all networked methods that route to a backup location, you will need to make sure that all firewalls on the route are set up to allow the connection. Consider, due to the need for security of sensitive data that may be in your backup data, that you may need to take special care over how and where you keep your physical backup media. Drives should be kept in a safe place, preferably in a location as far away from the original data as possible, in case of a physical emergency (e.g. fire, flood, theft), and, if possible, electrically isolated (power supply surges/sags). In commercial environments, employees that look after their own files separately from central data should be covered by a suitable backup and security policy. Sometimes, an application will place an exclusive lock on a file while it is in use and this will generate an error: "The process cannot access the file because it is being used by another process". Such files will not be backed up until the application has finished with the file (you can often identify the application by the naming of folders in the file's path, and shut it down to allow the file to be backed up). Typical examples of this type of file are used by applications using data in the %APPDATA% area, which are normally concerned with application settings rather than user data and therefore not necessarily a priority for backup (it depends of course on how the application is designed to work). The main buttons for the app are a row under the menu bar named "Run", "Halt", "Rescan", "Check List", "About", and "Help", plus two buttons at the bottom named "Minimise" and "Quit". This button starts the processing of folder backup pairs after a halt, starting a new scan immediately. Note that you don't normally have to click this button (unless you clicked "Halt"), as BackupCat begin processing folder backup pairs automatically after a startup delay when it is started by the Task Scheduler, or from the Start Menu, or the desktop shortcut if you created one during installation. This button stops the processing of all folder backup pairs. You will need to click the Run button to resume backups. This button starts a new scan immediately, which is useful if you have changed a non-NTFS source folder and you don't want to wait for the next periodic scan. This checks all the folder paths in the list for errors. If you get a "Destination path does not exist" error, and you know that you have removed a removable drive temporarily, you can safely ignore that error. Otherwise, it might call for investigation as to why the destination path is not available. Errors will also be shown in the Status column of the list. This button opens a dialog to display information about the version number, compiler, OS and build date. This should be quoted with any bug reports. This button minimises the app to the system tray and sets priorities to background levels. In normal use the app should be kept minimised, as priorities are raised to normal levels while the control panel is displayed, when there is more likelihood of backup processing competing with other applications for CPU time and drive I/O access. This button closes the app, after showing a confirmation dialog. If you answer "Yes", the app will close and backups will not be done until the app is started again. BackupCat logs its processing activities on the Logs page for monitoring and debugging purposes - in normal use, you don't need to do anything about them. If something goes wrong, you can go to the Logs page, right-click and select all, then copy (to clipboard), and paste the logs into a bug report. You might then retry backups with "verbose logging" enabled in Settings to get a more detailed report. Immediately on startup, the logs page will show the time the app started and the privilege levels, as shown in the accompanying screenshot. During startup, the middle pane of the status bar will show "Starting up" and the right pane how long until scanning begins. When scanning begins, the threads that monitor for changes in source directories will be created and listed on the Logs page, as shown in the accompanying screenshot. Clicking the Halt button will terminate the threads, and clicking the Run button will create them. The middle pane of the status bar will then show how long until the next periodic rescan. During backup processing, the middle pane of the status bar displays the stages of processing and the right pane shows the folder paths. The settings page allows you to configure how the application runs, backs up files, and reports errors. Timings are adjustable. By default, this checkbox will be checked and BackupCat will be started automatically when you start Windows and log on to your account. This is done by the system Task Scheduler. If you uncheck this box, BackupCat will not run from the Task Scheduler. You can run BackupCat via the Start menu or the desktop shortcut and check the box again to enable it to be started automatically by the system Task Scheduler again. In Windows 7, click the Start button and search for "Task Scheduler", or open the Control Panel, then the Administrative Tools window, and look under System and Security. In Windows 10, search for "Task Scheduler". Open the Task Scheduler icon or link. When The Task Scheduler window appears, click on the "Task Scheduler Library" entry in the tree view at the top left. The BackupCat task should appear in the main list, under a name starting with "BackupCat". When checked, shows the app in the Windows taskbar as well as the system tray when minimised. Clone/Mirror mode (default) ensures that everything is copied from source to destination, and deletes files at the destination that are not at the source. In clone/mirror mode, if a file's size or modification date is at all different on the source and destination, that file is copied to the destination. Files considered identical are not copied. Update mode copies only files that are newer at the source or don't exist at the destination, and doesn't delete files that are only on the destination, so if you delete something at the source, it will be left unchanged at the destination. When checked, logs extra messages about the backup process (mainly intended to assist developer debugging), as well as the normal status and error messages, as illustrated below. When checked, error messages relating to privileged file access are logged (this may indicate failure to copy some file attributes to a copied file, or failure to access protected files). When checked, reports of Windows Change Notifications are displayed in the log window. When checked, the program starts non-iconised, showing the control panel, when run by the Task Scheduler. 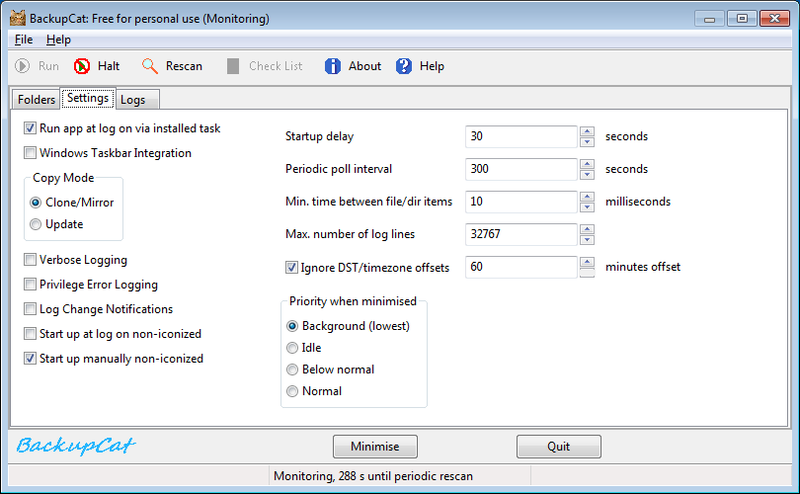 When unchecked, the program immediately minimises to the system tray when started by the Task Scheduler. When checked, the program starts non-iconised, showing the control panel, when run normally, e.g. via a desktop shortcut or the Start menu. When unchecked, the program immediately minimises to the system tray when started. This sets the delay between the program being run and the first backup scan. This allows the system time to initialise properly when you start Windows, log on and BackupCat gets launched by the Task Scheduler. This sets the interval between the end of the last periodic poll and the start of the next. Sets the delay between processing individual file or directory items. Setting this shorter than the default will increase the load on the system, while setting it longer will improve responsiveness of the user interface / control panel, but will make it take longer to process backups. It is recommended that this be left at the default of 10 milliseconds. This limits the number of lines retained in the Logs page. When the number of log lines reaches the limit, a proportion of the oldest lines are deleted, so that the memory used by the control cannot grow indefinitely. When this box is checked, files with the "minutes offset" time difference will be treated as having the same time stamp, to allow for variations caused by summer time shifts. This should be set to the normal summer time shift at your location (e.g. 60 minutes) and is used when the "Ignore DST/timezone offsets" checkbox is checked. This allows the process priority of the program when minimised to the system tray to be selected. 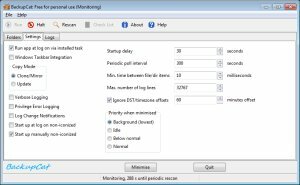 The default is Background, which ensures that the program runs unobtrusively in the background without slowing down other applications by competing for CPU time or drive access. If you would prefer to have backup running at a higher priority when minimised, select one of the other radio buttons. Background: Resource scheduling priorities of the process (and its threads) are lowered so that it can perform background work without significantly affecting activity in the foreground. Idle: Threads run only when the system is idle, but system responsiveness may be affected by disk and memory I/O. Below normal: A level between Idle and Normal priorities. Normal: The normal priority commonly used for most processes (the same priority as when the program control panel is displayed). The main menu contains File and Help menus. File/Quit does the same as the Quit button; closes the app and stops all backups. This does the same as the About button, opens a dialog to display information about the version number, compiler, OS and build date. This opens the registration dialog. You do not need to register for private, non-commercial use (see Licensing & Updates for details). You may also use this Software free of charge at your organisation or place of business or for commercial purposes on one computer only for evaluation purposes. Additional copies require registration with a licence key. To register, you must supply the Product Key and in return (for a licence fee) you will be supplied with a Licence Key. Enter the Licence Key where indicated on the dialog, then click the Enter Key button. For more information about applying for a licence key, see Licensing & Updates (the "Request licence key" button also opens the same help page). There is a button that allows for removal of your licence key, after displaying a confirmation dialog. There is normally no need to use this except for testing, and should you use it you should ensure that you have a copy of the licence key available to re-enter it if you want to restore the registration. When you configure your backup system, you may find that you need to install extra hardware to provide the independent storage media that will host the backup copies of your original files. These are some helpful links to relevant sites. It is recommended that you fully test BackupCat by comparing the results of your backups using an independent tool, after initial use, and from time to time. This is a sensible approach with any backup system, since you do not want to discover problems in your setup only after suffering a hard disk failure with your source data. One quick check is to right-click on the source and destination folder of a pair in Windows Explorer, and select Properties for each one. The resulting number of files and size should match, but there may be discrepancies caused by Windows not counting some hidden files, especially when in system folders, and due to recent activity in creating or removing files, as when backing up files structures of significant size BackupCat will take some time to complete each cycle of checking files and updating the backups. A useful tool for comparing source and destination folders is FreeFileSync, which is a freeware program from "Zenju" at http://sourceforge.net/projects/freefilesync/. This will compare two source and destination paths and show you the differences. You will be able to check which files differ on both sides and see if there are discrepancies or if differences are due to recent changes that haven't been processed yet. [When downloading and/or installing FreeFileSync, be sure to check for adware options that might be bundled with it from time to time and disable them, and always check downloads with a scanner such as Malwarebytes before using]. If you have problems using the latest version, try version 3.9 from http://www.freefilesync.org/archive.php, as later versions may hang on "Encoding extended time information" in some systems. Note that when using a file sync program for verification, it may modify the source folder (e.g. FreeFileSync will write a temporary Sync.ffs_lock file there) - as this will trigger a change notification and start backup procedures, you should close or halt BackupCat before running the sync program on the same folders, to avoid confusion. When you specify a folder pair, all directories under the source folder/directory will be copied to the destination, keeping the same nested folder structure. Note that as you can specify the destination folder name independently, the top level folder name may differ from the source. BackupCat attempts to copy file attributes as closely as possible, including file dates, readonly, security and hidden (if enabled for copying) attributes. Security permissions applied by the system may limit what can be accessed. BackupCat makes use of Windows change notifications to monitor the contents of a source directory and its subdirectories (NTFS drives only). When something changes within the directory being watched, BackupCat receives a notification from the system and carries out the appropriate backup operation to update the destination. As a separate thread monitors each folder pair, change notifications can make your backups more efficient if you select the folder pairs so that your file usage is likely to be concentrated in one of the pairs mostly at any one time. If meanwhile there are no changes in the other pairs, then BackupCat will only need to scan the changed pair. Entering backupcat -h on the command line will result in a list of command line options, i.e. Normally there is no need to use these, and the task option will be used automatically when the app is started by the Task Scheduler. If the /t flag was present, and the option to enable the app to run if it is started by task scheduler is not checked, the app will exit. It is recommended that you run BackupCat as a normal user (i.e. not elevated) if possible, because network shares may not be available to it if run as administrator, due to issues to do with Windows security restrictions. Files that you need to back up should still be available to copy because they will only be read from. Make sure you have write permissions as an ordinary user for each drive and folder that you have specified for a backup destination (this will normally be the default for your drives outside of system folders). If you need to run with elevated privileges, your user account needs to have membership of a group that grants elevated privileges, e.g. Administrators. You will need to edit the Task Scheduler task (double click on the BackupCat task in the Task Scheduler Library, and on the General tab check the "Run with highest privileges" checkbox), the desktop shortcut (right click, select Properties, Compatibility tab, and check "Run this program as an administrator"), or right-click on the desktop or start menu shortcut and select "Run as Administrator". When the program runs from the task scheduler with "Run with highest privileges" enabled, it will run the task automatically when you log on without you getting bothered by a UAC prompt for permission. This is because the scheduled task inherited permission for elevated privileges from the permissions you gave when running the installer. If you start it separately using the desktop shortcut or the Start menu, and run it "as Administrator", you will need to grant permission to run to the UAC prompt that comes up, unless UAC is turned off on your computer. If you are backing up files from a different user, sometimes if you have set permissions to gain access to a user's My Documents or Desktop folder, you may still get "access denied" errors that show up in the Logs for subfolders such as My Music, My Pictures or My Videos subfolders. If you have set the source folder to scan the whole of the C:\ drive containing Windows, system folders such as "Documents and Settings" (obsolete since Vista, now just a junction point to the Users folder) will generate "access denied" errors. The Users folder, and more specifically the subfolder for your own user account, should be used as a source instead. Other Windows system folders will also generate this error. An example is shown in the accompanying screenshot. Right click the parent folder, e.g. My Documents, select Properties, then the Security tab. Check that you have suitable permissions on this folder. Click the Advanced button, select your user name, and click Change Permissions. Check the "Include inheritable permissions from the object's parent" checkbox if not already checked. Check the "Replace all child object permissions with inheritable permissions from this object" checkbox, then click the OK button. Network resources such as shared drives may fail to appear on your computer, or exhibit problems with copying files, due to potentially many different networking problems. The following tips may help to resolve the problem, if not you may need to investigate further. Take care when modifying computer settings (do so at your own risk! ), and if necessary get help from someone with relevant computer and networking experience. In a corporate environment or large organization, your network may be set up to use "Active Directories". To check access to network resources in such an environment, please consult your IT administrator. Open the Network and Sharing Center, then click "Change advanced sharing settings". Turn everything to OFF on all profiles and options, save changes and close the dialog. Then go to the Device Manager (enter "Device Manager" in the Start search box and click on "Device Manager"), find your network adapter under Network Adapters in the tree, right click on the adapter and click Uninstall. Make sure that the "Delete the driver software for this device" checkbox remains unchecked before clicking OK on the uninstall dialog. Then right click on "Network adapters" and select "Scan for Hardware Changes" (or select the same from the main menu - Action), which should reinstall the adapter, and close Device Manger. Next, open the Network and Sharing Center again, click "Change advanced sharing settings", and turn all options to ON on all profiles, save changes and close the dialog. Check if you can now access your network shares or NAS login normally, then review the advanced sharing settings to disable some of the settings that you don't want, if required - if this causes the network shares to become unavailable, revert the settings one by one to find out which one caused the problem. Rate limiting on network switches may interfere with file transfers between devices on different sides of the switch. Devices on different Virtual Local Area Network (VLAN) domains may not be able to transfer files. Check for problems by connecting your computer as closely as possible to the target network device, e.g. to the router or hub nearest to a network storage device. Check that your computer is configured for the same workgroup as other network computers or devices on the network that you need to communicate with: Go to the Start Menu and search using the word "workgroup". Click on "Change workgroup name". The System Properties window opens. In the Computer Name tab, click or tap the Change button. The "Computer Name/Domain Changes" window opens. The workgroup is displayed in the Workgroup field (default: “WORKGROUP”). If you change it, and click OK, you will need to reboot. Network devices such as routers may have a USB settings menu where you can enter the workgroup used with Windows. Workgroup networking should normally work when Homegroups are enabled, however, some people have reported issues with Homegroup settings interfering with network resource access. It should be noted that BackupCat has been used successfully on a machine set for Homegroups with network sharing as well as machines set for a "Work Network". If you use Homegroups, make sure your network adapter has IPv6 protocol enabled, the "Homegroup listener" and "Homegroup provider" services must be running, File Sharing must be enabled, and computers must be on the same Subnet. To disable Windows Homegroup networking: Open the Network and Sharing Center (enter "Network" in the Start search box and look for "Network and Sharing Center", or click Start, Control Panel, Network and Internet, click "Network and Sharing Center", or click the Network icon in the System Tray and click "Network and Sharing Center"
Under "View your active networks" / Network, will be displayed "Work Network" or "Home Network". If it shows "Home Network", click on it and select the "Work Network". Warning: Serious problems might occur if you modify the registry incorrectly by using Registry Editor or by using another method. These problems might require that you reinstall the operating system. Modify the registry at your own risk. Do not edit the Windows registry unless you are confident about doing so. Check the registry key at HKEY_LOCAL_MACHINE\SYSTEM\CurrentControlSet\services\LanmanWorkstation. If there is no SESSTIMEOUT entry, add a DWORD value and set it to decimal 360. This is the amount of time the server message block (SMB) file sharing client waits for the server to respond to an outstanding request (default: 60 seconds). Note that if you are getting these timeouts, it may be indicative of other problems existing on your network. Error 64: "The specified network name is no longer available"
This is a Windows networking error, which means that your client computer lost connection to the server computer (i.e. a remote directory on a computer or router). It might be fixed by just rebooting the devices. Check if the local or remote directory has had files locked by another application. Consider also increasing the SESSTIMEOUT parameter as described above. If you want to back up your list of folder pairs, you can access the file by using the Start/Search box and entering %APPDATA%; click on "Roaming" or "%APPDATA% File Folder", open the subdirectory CJSSoft, under that is a subdirectory BackupCat containing the folder pair settings file Settings.ini. The location of the %APPDATA% folder is also shown in the About dialog box, and is included automatically by the "Common Backup Pairs" wizard. BackupCat keeps a record of its run sessions in the same location as for the list of folder pairs, in a file named logfile.txt. When this reaches a certain size, it is renamed to logfile.txt.bak and a new log file is started. These log files contain logs of the times when the program was started by the task scheduler or the user, when it was halted or stopped by the user, or when it was stopped by a system shutdown (due to the user logging off or shutting down the computer). These logs may be useful for debugging purposes, i.e. to check if the program was actually running when it was expected to be running. BackupCat does not collect any personal information or send anything over the internet (apart from backups that you configure to be saved via the internet).